Hello everybody, I am back with another good article for covering security in .NET framework for passwords of users. Although I was very much disappointed by the articles and resources published previously by many editors and authors. So I thought I must publish an article that covers all of the parts, that a good article needs. What is cryptography? Why protect the passwords? How password should be protected? What algorithms are there to protect my password. Which of those algorithms are out-dated and which are expensive for my company? Where would the algorithms in .NET framework work. And many more similar things are discussed there. Another major thing to understand is the usage of Salt. A salt is a random string generated to prevent password cracking attacks, such as Rainbow Table attack, Dictionary attack and many more. Salt just prevents any of them from happening. Hashing, is an algorithm function that generates a random alphanumeric string for a password that is impossible to convert back to plain-text password, easily. Note the term, “easily”. Although a hash algorithm is designed to never run backward, still computer can run such algorithms that can get the password string back or at least try as much combinations to get the same hash value! You should read the article from C# Corner, and learn how to protect passwords and other sensitive data in .NET framework. This entry was posted in ASP.NET web sites and web applications, Beginners, C# (C-Sharp) and tagged .NET, .NET framework, algorithms, beginners, c++, cryptography, hashing passwords, learning, passwords security, secure passwords, security on July 31, 2015 by Afzaal Ahmad Zeeshan. The above image demonstrates the rule for you. I would try to explain them in a form they are meant to be explained. First of all you need to make a list of questions or items you need feedback in form of. This is the most important part of a form. If your feedback form doesn’t even provide you with enough details and answers, or if you have to create more than one form for one subject. Then it is not very much good enough. Mostly, feedback or reports are generated by software itself; logging. Software would generate everything itself. But in some scenarios you have to ask user to provide some input. In such cases you have to generate UI for him. In such scenarios, you are required to create a UI in a very compact, yet efficient manner. I have also explained this stage in a box above. Read it. You must not refrain from your UX rules. The controls and theme that you chose for your feedback pages must conform to UX and UI guidelines for your application. You should always consider testing your application for good UI and UX standards. Next stage is somewhat optional that is why it is being added as a catalyst only. Mostly targeted audience is same throughout application cycle. But, you should always consider this stage if your application has to worry about globalization and language or other requirements. But if your application doesn’t consider such changes then you don’t have to work on this stage. Final stage is the output. To get good reports forms, you should always consider focusing on Step 1, 2 and 3 only. Making a change in Step 2 only would ensure that your application has a great form of reports page. 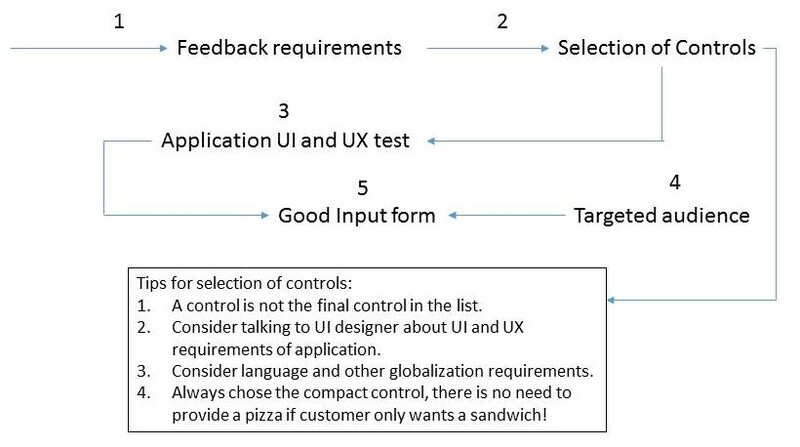 You should always try to work around with UI and UX team to get suggestions for layout of controls and how should they be in order to get good UX and UI standards for your application. This entry was posted in Beginners, Software Development, Web Development and tagged feedback forms, programming, reports forms, software development, software development rule on July 5, 2015 by Afzaal Ahmad Zeeshan.